Early Creatasous, china: A yutyrannus huali,a giant,feathered tyrannosauroid wakes up,only to see the open jaws of a huge Sinotyrannus kazuoensis, another tyrannosauroid which is even bigger than yutyrannus itself! 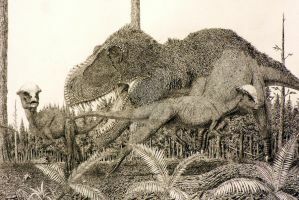 The Yutyrannus tries to get up, but the sinotyrannus is already in attacking position. Both animals are tyrannosaurs, but sinotyrannus was maybe 1 metre longer than yutyrannus. Both animals lived in china around the same time. I planned this since one week after the announcement of yutyrannus. Why? Because it is not only an awesome fight between two awesome dinosaurs(and I am also the first one to make such a fight), but also because sinotyrannus is such a poorly known to the public,while yutyrannus dicovery caused a huge media response. So I want to make sinotyrannus more popular, because it is just as awesome as yutyrannus ! He is bigger and has those long powerful arms. Would you do Sinraptor and Shunosaurus? i disagree with Sinotyrannus' length. it is over all lighter and smaller than Yutyrannus. plus, i think Yutyrannus has the stronger bite. but as a scenario, i love this drawing. these predators in battle will end up dueling to the death. perhaps, but i think if Yutyrannus was to bite the head, Sinotyrannus would be dead dino walking. Same if Sino did that to yutyrannus. I'm thinking Yutyrannus might have had the stronger bite. Awesome battle positions! I wish that I could get an art teacher to show me howdo things like this! Once again, magnificent!!!! As much as I love the dinosaurs, and I DO, I'm also diggin' the scenery! Yay Foliage! thanks a lot. I think it tookseveral hours to complete the picture. I started it in the evening, made the head of the sinotyrannus,went to bed, and the next day I drew the whole day to finisch this piece. It took over 6 hours to finish it. Excelent. Yutyrannus and Sinotyrannus needs an action scene! Now that's the spirit, nice work . Man, I've been waiting for someone to make a picture like this! Thank you! Yutyrannus is from the Yixian Formation, which is a couple of million years older than the Jiufotang Formation Sinotyrannus was found in, so they didn´t really coexist. Maybe (but that´s just an idea) Sinotyrannus is the direct descendant of Yutyrannus. They are not that closely related; Sinotyrannus appears to be a Proceratosaurid while Yutyrannus is more advanced. This is unusual considering the latter is older. There appears to be a rumour that there was a carnosaur that was contemporaneous with Yutyrannus. I imagined something like that. Thanks a lot for clearing it up! 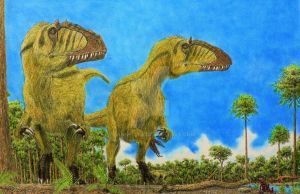 Sinotyrannus und Yutyrannus lebten wohl ebenso wenig zeitgleich wie Giganotosaurus und Mapusaurus oder Albertosaurus und Tyrannosaurus. Das mit den formationen halt ich persöhnlich für ein nicht grade starkes argument. Ich meine, warum sollten sich die territorien dieser beiden tier nicht überschneiden. Vile heutige tiere habe einen sehr großen verbreitungsraum, wieso auch nicht diese beiden? *plays Jurassic Park music from when the T-Rex saves the people from the Raptors. BATTLE OF THE FREATHERED TITANS! !